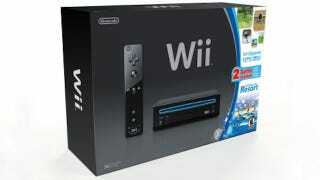 In advance of the Wii U's November 18 launch, Nintendo is cutting the price of the current Wii console to $129.99. The console, which will be black, will be sold in a bundle with Wii Sports and Wii Sports Resort (on one disc, interestingly enough), a Wii Remote Plus and Nunchuk. The bundle will start trickling to stores now and be widely available by October 28. The Wii had been selling for $150. The Wii U, which is backwards compatible with the Wii, will go on sale in November in two configurations that will cost $300 or $350, the latter bundled with a game and packing more on-board memory. Microsoft started selling new, cheaper $250 bundles of the Xbox 360 just yesterday, one with Kinect, one with Skyrim and a big harddrive. Sony's newest super-slim PS3 is selling in two bundles for $270 and $300, bundled with games and big harddrives.